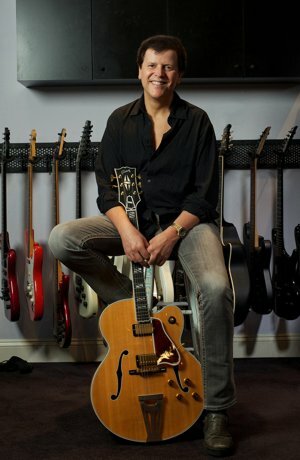 As someone who has reinvented himself several times over the course of his career, it's always an adventure to follow Trevor Rabin, the guitarist who went from being a teen idol in his native South Africa to a worldwide star as the wunderkind in the revamped 1980s version of Yes, penning what is still their most popular song to date, "Owner of a Lonely Heart." Having spent the past sixteen years as a successful film scorer, Trevor has blazed a new trail once more with the instrumental album Jacaranda (Varese Vintage Records): blending elements of traditional jazz, fusion, bluegrass, progressive and classical to create a compelling and well-crafted musical statement; the release has received overwhelming acclaim from critics and fans alike and has made a Top Twenty debut in the Billboard Jazz charts. I discussed the genesis and development of the album in a series of exchanges (via email and phone) with Trevor, as well as other topics relating to his nearly 40 years of popular and critically-acclaimed status as a working musician. 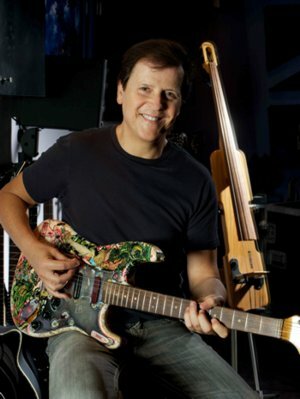 Jacaranda is perhaps the most personal musical statement ever created from the heart and mind of Trevor Rabin; beginning, of course, with the title of the album itself: a wholly appropriate appellation given how it has figured in his own referential landscape over the years. "It’s one of my favorite words…along with 'Shelley,' 'Ryan,' 'love,' and 'music,' he noted. "It’s the tree that lined the streets where I grew up and it seemed to fit the collection very well. It’s also the name of my studio." When I asked if the titles of the songs - also references specific to his life in his native Johannesburg - were meant to evoke those early years, Trevor affirmed the notion. "Absolutely. The titles were for the most part inspired by my first two decades growing up in South Africa. 'Me and My Boy' is self-evident, but the liner notes talk of each song, the title, and what it means to me." His reference is to the packaging for the album, which also reveals many personal touches: the cover portrait was painted by Hannah Hooper, his son Ryan's bandmate in GROUPLOVE. Trevor and his wife Shelley consider their son's cohorts to be as much their children now too, helping to nurture the dream by housing the band, providing studio space, equipment and advice, during the recording of their debut EP and showing their support in attending many of the band's gigs and appearances over the past two years. The booklet insert portrait of Trevor and his famous '62 Stratocaster was taken in his studio, and the back cover photo is another portrait of the Strat taken over twenty years ago. The liner notes were composed by Trevor as a chronicle of his memories and impressions in regards to each track. Trevor's long-time colleague and friend Paul Linford mastered the album; even Trevor’s dog Rompie makes an appearance on a track (“I should have given him an actual credit,” his owner quipped.). But that self-referential focus began with the recording itself, as Trevor worked between scoring assignments strictly for his own enjoyment and creative fulfillment. But Trevor's ambition in regards to the scope of the project was there from the outset, ever striving to create something innovative in regards to his own abilities. "On every track I wanted to explore something new," he declared. And the risk inherent in such a mindset did little to dissuade him from that goal. "If you’re a musician and you want to succeed, you want to get better, you'll have to take risks," Trevor explained. "There is simply no way you can grow without taking chances. Succeeding takes time and prolonged effort no matter what the odds are against you. The recording process of this album took over six years – in between working on films and as inspiration struck. This is what defines the music." Trevor realized this direction was likely to be somewhat controversial within the section of his fanbase still very attached to his former identity as an AOR hitmaker/guitar god/heartthrob, but is primarily optimistic regarding the evolution of their tastes. "You always hope fans will follow into your creative journey," he mused. "I'm sure I'll be back doing a rock record at some point." He also desires to remove any doubts regarding his future as a singer: "I have definitely been working and thinking with voice in a more profound and central sound, and that will be included in whatever I do next. I definitely intend to sing on the next project, I'm ready to sing again, although Jacaranda just happened in the instrumental way. I did get to a point where I consciously decided not to include vocals, for the most part." Much of the public expressed surprise and even skepticism when the project was revealed - in the course of interviews conducted a couple years prior to release - to be an instrumental record with a primarily jazz-minded orientation. But what many were not aware of, in the overall history of his musical career, Trevor is no stranger to jazz: either traditional or fusion. During his years in Johannesburg Trevor was a fan of jazz as well as a player, recording and gigging with many South African jazz musicians, such as Hennie Bekker and Ratau Mike Makhalemele (in the liner notes for the album he makes mention of the Hennie Bekker Band as an ensemble he greatly admired and followed) and I asked him if playing jazz was as serious to him at that time as his burgeoning aspirations of becoming a classical music arranger and conductor, perhaps even more serious than his actual gig as the leader of the pop-rock band Rabbitt. "They all had equal importance to me but for different reasons," he responded. "As far as seriousness goes playing jazz was purely about the music and had nothing to do with any marketing strategy or genres unlike Rabbitt where marketing and packaging were part of the business. Jazz always had a place in my heart. Whenever I listened to or wrote jazz as well as classical music, it was always done for the natural or sheer joy of it. I never confused it with it being a rock record." In keeping with the tone of the album I asked Trevor to discuss those guitarists who had influenced him in regards to the idioms he explores; I cited John McLaughlin as one who, by his own prior admission, is a major influence. "I like McLaughlin. I wouldn’t say he is my hero, that belongs to Arnold Schoenberg. Originally Hank B. Marvin was an influence then Johnny Fourie, Joe Pass, Barney Kessel and Herb Ellis were significant influences as well." During his initial residence in Los Angeles in 1981 - the result of a development deal with Geffen Records - Trevor was offered a slot in the first version of The Guitar Trio with McLaughlin and Paco de Lucia. Such a coveted gig would have been a dream come true for him, but alas it was not to be. "I would liked to have done it, but I was hard at work for Geffen Records," he recalled. Jacaranda afforded Trevor the chance to work with jazz musicians once more, such as Australian-born bass wunderkind Tal Wilkenfeld. Her colleague, noted jazz/rock drummer Vinnie Colaiuta, brokered an introduction and Trevor was taken with her tonal talents, having Tal play on the track "Anerley Road." "I simply thought that her approach would be perfect for this piece, and I was extremely happy with her performance," he explained. "Her style is very different from mine. Also I believe she's one of the greats of today." The album also features three excellent drummers in Lou Molino III, Vinnie Colaiuta, and Trevor's son Ryan, and with such an embarrassment of riches to choose from, I asked him if the assignment for each piece became a matter of expediency. The material provided some true challenges: such as a 20/8 shuffle on "Through The Tunnel" and a 7/8 time signature for "Me and My Boy." "It definitely wasn't a case of expediency. It was a 'gut thing' that went horribly right!" he joked. "I couldn't be happier with the way the drums turned out on the entire album. While I didn't plan the way it turned out, it was pretty natural how the drum takes evolved, but I thought a lot about who would be best on each track. They're all great drummers." Another notable contribution came from vocalist Liz Constantine, who reprised her performance on a reworking of the theme "Rescuing Fischer" which Trevor originally composed for the 1996 film The Guardian. The revamped version is simply known as "Rescue." "I had to redo the song," he explained, "as I don't own the master from The Guardian…but Liz did a wonderful vocal, and I obviously changed quite a bit." "Rescue" and "Killarney 1 & 2" form the emotive center of the record - appearing midway in the running order - and these two compositions spring from very emotional places in regards to the aim of the creator. The former is actually a part of a long-running tradition in Trevor's work of social commentary, going all the way back to a song he wrote in 1972 during his tenure with the South African anti-apartheid rock band Freedom's Children and continuing through the years with other songs as well as some of his film scores. Trevor recounted to me the inspiration behind the revision of that particular piece of music and how it reflects his thematic sensibilities overall. "As far as film scores go, I do what I feel is needed for the film. Luckily a lot of what I have done, and what I continue to do, involves a sense of triumph over adversity. I have often directed my lyrics towards political and human injustice. Whether it's '(Wake Up!) State of Fear,' 'Sorrow (Your Heart),' 'I Can't Look Away' dealing with apartheid, or 'Miracle of Life,' dealing with human injustice towards animals. Jacaranda is purely a musical journey, particularly given that it is an instrumental album, although reference is made on most of the compositions to South African places and things in the title. The one exception to that would be the song 'Rescue.' The re-working of 'Rescue' took place when the tsunami struck Japan and the sheer devastation it caused. Seeing the thousands of people homeless and grieving while still remaining dignified and respectful is what impressed me more than anything else. It’s this sense of courage and hope – in all human conditions - that 'Rescue' speaks to." The lush classical aura of "Killarney 1 & 2" - primarily a piano-based piece - is also a beautiful surprise for listeners, and knowing Trevor was a trophy-winning prodigy in his formative years as a classically-trained pianist, I asked if the track was a tribute to his childhood and musical evolution. Trevor’s childhood was also defined by the absence of a medium which many of his generation take for granted: television. Broadcast television was not introduced to South Africa until 1975, and I asked him if music became that much more of a guiding force due to a lack of the influence and distractions of television. The album starts off with the fleet-fingered "Spider Boogie," a rare one-take moment for a man who has a serious reputation as a perfectionist: "I was actually exploring sounds on a new amp I was using," he explained. "And the body of the piece came straight out of me messing with the amp. It started with me checking it out, and liking what was happening." I commented to Trevor that the sheer range of styles and textures on the album was quite surprising to fans and critics alike, and I imagined mixing must have presented a challenge, given the number of layers involved and instruments featured. "Every sound, every part, was arranged so as to best allow the ear to follow the path of the song," he told me. "Although the hope is that with every listen, different layers and dimensions would become more 'visible,' as the ear became more familiar with the song." Trevor recalled his original impetus in becoming an engineer, coming up in the 1970s as a session musician: "In the very early years of doing session work, I used to go into the control room to listen to playback, and often I would be disappointed that it sounded worse than it did in my headphones while doing the take. I decided then that I would get into engineering so there would be an unbroken thread from the start to the final. And when I'm working with engineers, it gives me the vocabulary to converse properly." This led me to comment on Trevor's status as a producer/engineer, and how - when working with outside producers in the past - it sometimes led to a clash in regards to roles. But as the auteur on this record I wondered if he ever felt the need to step back and seek external guidance and opinions. "I always enjoy advice from people with good ears," he replied. "Although sometimes I get frustrated when people speak too early." The merging and melding of styles on Jacaranda is one of the album's primary charms and I wondered if his use of bluegrass and roots idioms on various soundtracks over the years led to his musical vocabulary being further enhanced by those experiences and thus his writing for the album. "Also accurate, that's a good point," he observed. "I've always loved the sound and musicality of bluegrass, and have gone there a lot on some of the scores. But I felt there was no reason not to see what happened when attempting to merge a number of styles together. The merging of styles was very important to me on the album, it’s part of what made this album exciting for me." I pointed out that one of the reviews for the album noted the tracks were more concise and structured than a typical fusion-based recording would be, and inquired if that was a purposeful agenda in regards to his compositional aims, or just the result of the process entire. "I think both," he replied. "I had a lot to say, and while I could have spent more time improvising, I think the balance musically is precisely what I was going for. It's a result of the process, although there were areas where the solos were longer, but I felt that the final edits were right." Yet Trevor's orientation also lay firmly in another role he has long-held, that of arranger. The limitations of film scoring, of writing to picture, did not hamper him in the composition for this project. "It's all part of thinking as an arranger. I was never into a mindless wall of sound providing an 'apparent' grandness, with little thought to intricacy. It was different, as I made a reasonably concerted effort to record only ‘real’ instruments, and leave traditional orchestra out of the equation." The multitude of textures was not dictated by the choice of instruments so much as the desire to write in the same way Trevor composes a score, using a classical model of creation. “It’s about colors, how you manipulate the colors, textures and voicings,” he said. Noting that even as it is an instrumental record there are some vocal moments in Jacaranda, I asked if the work itself dictated those particular choices. "I never intended for there to be any vocals," Trevor stated, "but 'Rescue' changed that. I also did little backing vocals on 'Gazania,' but it was purely arrangement-inspired, the small amount of my voice was purely a function of texture." As there is such an abundance of moods and styles I wondered what sorts of ideas might have been left out of the finished work, and Trevor's focus appears to have been honed in on the primary goal from beginning to end: "I think I had a pretty good idea of what I wanted throughout the project. One of the main things I wanted was to let things flow, and let things come to me without forcing it." It is well-known that Trevor is the product of an artistic family, one which has produced a number of musicians in each generation, and just as his father Godfrey - a violinist who performed for many years in the Johannesburg Symphony - played on some of the records he recorded in South Africa, Trevor continues the family tradition with his son Ryan contributing to two tracks on Jacaranda. I asked him if he believed there were any parallels in regards to the trajectory of their careers, given that his father had been a guiding influence for the direction Trevor followed. "The journey of being a musician is always different for everyone," he noted. "I think Ryan’s love for music is no different than mine though his journey is different. He’s a phenomenal drummer in a successful band; he’s a great producer, engineer and songwriter." In regards to his own professional journey, Trevor acknowledges that his abilities have strengthened since his days in Yes. "My judgment I hope is objective," he commented. "When I listen to previous moments that I thought were the best moments from Yes I realize that I’ve grown, that's about all. The moments in Yes which I am very proud of I still am. I just feel (and hope) people who are serious about their craft will advance. I feel I have." But concerning his writing, the same sense of the unknown which has defined his process continues to do so. "I never know when it’s going to hit. I never know where it’s coming from. The only thing I can do is go into the studio and decide I’m going in there to write and to create. If something hits me I’m in luck and if it doesn’t I come back another time." However, his reputation for being a proponent of the technological cutting edge appears to have shifted focus, his preferences now reside in the basics: "At the end of the day, that's irrelevant...the important things are the ideas, the piano, my guitar, pencil and paper." Prior to the release of Jacaranda, though Trevor had largely been out of the public eye for a number of years, his career has continued unabated but in a new identity: that of a film scorer. However, it was a desire he had long possessed, beginning in 1976 with a score for the South African crime drama Death of a Snowman, and so his decision to pursue it full-time was a return to form exactly twenty years later, in a barter of sorts which led to him scoring the Steven Seagal action film The Glimmer Man. Since that time Trevor has scored dozens of films, many of them in the action/adventure genre, but he has also gained a reputation as a strong choice for sports-themed films (Remember The Titans, Coach Carter, Gridiron Gang) and action-comedies (Hot Rod, Get Smart, G-Force). But a desire to diversify has also defined his scoring career, such as his choice of assignments – in genres new to Trevor - within the last year: the skiing documentary short The Movement: One Man Joins An Uprising, and the pilot episode of the upcoming ABC television program Zero Hour. Because Trevor has scored so many blockbusters - such as Armageddon and the National Treasure films, for example - many scoring purists consider him less of a serious composer than his peers. But the perceptions of the public and the politics of the industry have no effect on his working mindset. "I’m flattered to be considered what Hollywood considers as one of the 'go to' guys to compose for a film," he declared. "That never bothers me. Whatever people may think of the genre of whatever film I’m doing it’s extremely serious to me while I’m doing the film." An alliance with super producer Jerry Bruckheimer (Trevor related, “Someone recently told me, ‘Bruckheimer makes popcorn movies,’ and I said, ‘Yeah, but they’re the best popcorn in the world.’”), as well as close working relationships with various directors, such as Renny Harlin and Jon Turteltaub, are the fruitful result of a strong work ethic and a commitment to supportive collaboration and professionalism. Such characteristics made Trevor the obvious choice for the 2012 ASCAP Henry Mancini Career Achievement Award. Yet it is also true that many of his best scores outclass the films they were composed for, such as those for Whispers: An Elephant's Tale, Bad Company, and The One. "I would agree with this," he said, choosing to remain diplomatically non-committal as to specific examples. In addition to his musical abilities, Trevor possesses a talent for graphic arts as a painter, and more recently has developed an interest in photography and filmmaking. This allowed him to add yet another dimension to his auteur focus for the album. "I was having discussions about doing the video for a song on the album," he related, "and decided I know exactly what I want to do on this. Rather than explain it would be easier to learn what I need to know in order to do it. I spent a significant amount of time learning about photography, lighting, software and the video will be available soon." (Author’s note: the video for “Anerley Road” was released on August 1st and Trevor has also filmed a video for “Rescue” which will be released in future.) The promotional aspect led me to inquire regarding his plans for touring, as Trevor has commented in other recent interviews he does desire to tour for the album and would make it a priority if the opportunity arose. I asked if he has considered a format in regards to the performances, commenting that fan discussion appears to be in favor of two sets: one instrumental, one vocal. "Not really;" he responded. "I'm very busy promoting the album, making videos, but obviously I love to play so I'm certainly not ruling it out." Talk of promotion leads to considerations of distribution, which has changed greatly in the 21st Century in regards to the worldwide reach of the online world. Although Trevor chose a traditional method of releasing the record I asked if any of the new business models had influenced his thinking in that regard. "The way I create and approach it is no different," he asserted. "I think with regard to writing music when I think I’ve got something I can put forward that’s interesting that I’d like people to hear it gets distributed. Today it’s a different way of distributing than it was before but it hasn’t changed my outlook on how I do things. In today’s new world distribution one of the sad issues for me is the culture of pirating from the internet and downloads being an acceptable thing to do. Ultimately it robs the world of the ability of people to look at music as being an avenue as a career because the more it is depleted by theft the less people will have the desire to enter the business." Jacaranda presents a unique opportunity for Trevor to be considered as a consummate artist in a context which includes his known abilities and yet lies outside of his previous identities. In relating the overall process, Trevor is not particularly worried in regards to the collective mindset of his potential audience. "I don't think about this much," he admitted. "You can never determine what reviews will be on a project, sometimes they're good, sometimes bad. I'm very happy that so far the reviews on Jacaranda have been very positive. It's unfortunate that many musicians, actors, painters, etcetera, get pigeonholed for what they might have succeeded in. I think this album is the first time I feel fulfilled as far as presenting a piece of art, and representing who I am as a performer." When expressing his thoughts regarding the creative experience entire, Trevor drew a parallel with the composers of yore: "When one talks of the old classical composers, one doesn't talk a lot about arrangements...because the arrangement was always a part of the writing, and I firmly believe that the arrangement is part of the composition. On my film scores, all arrangements are concluded before ever sending the music to be prepared for orchestra. So to me, the arrangement is part of what I do, and I believe, part of the art of writing. I was always so excited to get back to the studio on Jacaranda, to continue even when I was having difficulty, and I never got tired of the process. Many days I would go in at midday, and at 11pm I would say to myself 'Wow, I'm hungry!'" In further acknowledgement of the enjoyment he experienced in its creation, I asked if Trevor would share with readers some of the great moments involved with the making of Jacaranda, and he immediately named two: "I think the first sense that I was onto something I was going to enjoy doing, was the early stages of 'Market Street.' It felt right, and I think I'll remember the moment. And watching Ryan perform on 'Me and My Boy' will forever put a smile on my face." As a whole, the musical statement of Jacaranda reveals Trevor’s strong commitment to his artistry and the proud regard he has for the result. I asked if creating something so deeply affecting from a personal standpoint had a life-changing effect on him: “Absolutely. I don’t think I could ever make a record now like I did before. I don't believe I've ever experienced more natural flow and ease than on this album and I love this project more than any other." About the author: Acknowledged by Trevor Rabin as an expert on his career, Julie is the creator of Rabin-esque (rabinesque.blogspot.com), a blog devoted to cultural criticism and analysis of Trevor’s musical history. Julie’s review of Trevor’s new album Jacaranda can be found here.